Would standing on the left get you through Tube stations quicker? An incredible 1.305 billion passengers use the London Underground on an annual basis. Not only does Transport for London (TfL) have the inconceivable job of moving these passengers quickly around the 402 km network, they need to get these passengers around the various stations as quickly as possible. That is why TfL are trying an experiment at Holborn Station: they are making everyone stand on both sides of the escalator. So, how would this improve the customer journey? Well, it’s all about wasted space and queues. On an escalator, commuters stand on the right and those who want to walk, on the left. Those who stand on the right-hand side tend to use every second step, whilst those who walk are likely to take up three steps per person, which wastes space. Moreover, the majority of travellers prefer to stand, particularly in stations with long escalators, which further decreases the utilisation of the left hand side. So by making passengers stand on both sides the available space should be used more efficiently. 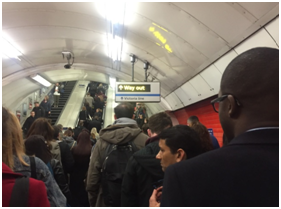 The blogging team decided to build a simulation model to mimic the behaviour of commuters on an escalator on the London underground during the rush hour period on a Monday morning. These types of models are built on computers to mimic real life activities. Even 3D models are possible! The method has many useful applications in the business environment such as improving passenger flows through airports and the sizing of a call centre. Fewer people can fit on the ‘walking side’ of the escalator – around 70% as many as those standing. This is because a ‘walker’ occupies more steps than a ‘stander’. What we didn’t measure, which is what have simulated, is how long it took us to queue just to get on the escalator. It is at this stage where TfL believes the time will be saved. In the model, we assumed that trains arrive every 2 minutes on each of the two platforms and that that about 65 people get off each train, which leads to roughly 4,000 persons who use the escalator in one hour. It is important to note that we built variance into the model to mimic reality as much as possible. For example people walk at different speeds. Some people face obstacles whilst walking up the escalator. For example, those who stand on the right sometimes have their large bags blocking people, or the annoying tourists that stand on the left. To investigate the impact of the new policy, we ran our simulation for two different scenarios. So the results show that, on average, commuters will take 59 seconds to get to the top of the escalator after the change. 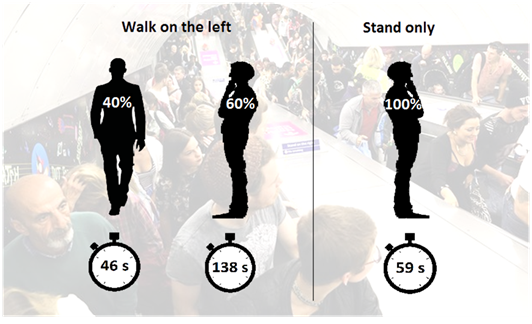 For those who would be standing anyway; they would spend an average of 79 seconds less queuing for and travelling on the escalator. This will benefit 60% of all passengers. So what about the 40% who like to walk up the escalator, including our bloggers Lukas and Shiv? We would end up spending an extra 13 seconds in the system; which works out to be a 29% increase. Another benefit is that average queue lengths would drop by enforcing the standing policy, as illustrated below. This means less time spent at the bottom of the escalator, and more people can flow through the station. So, the majority of commuters would benefit from the proposed changes. However, the benefit comes at the expense of those in a rush. There goes our plan of a 30 second lie-in. What will be the impact of a snap election on turnout?